0% interest for up to 48 months financing available with approved credit. Click on Financing link to apply now! Expanding on our zero turn lineup of commercial lawn mowers, the SRS Z2 mower delivers the kind of heightened productivity that has become synonymous with the Ferris brand. Precision-engineered for superior maneuverability and balanced stability and traction, the ergonomically designed SRS Z2 mower is loaded with innovative features that live up to Ferris’ unwavering commitment to quality. Now, let’s talk about these features – cutting-edge features that’ll get your juices flowing! Out-front you can choose between a Vanguard™ 810cc EFI lawn mower engine or a Kawasaki® FX801V. Both deliver big power for big performance and both are backed by a 3-year limited manufacture’s warranty*. Of course, with fuel economy becoming more and more relevant, the Vanguard 810cc EFI engine boasts optimum power with industry-leading fuel efficiency. We’re talking a reduction of fuel consumption by up to 25% while unleashing 28 gross hp** (810cc). On to the SRS Z2’s drive system. 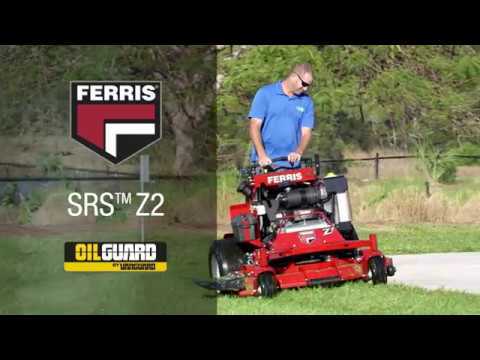 With an up-to 10 mph ground speed, the SRS™ Z2 covers more grass in less time. And our easy-locking 3-position ground speed control ensures smooth operation in tight and wide-open spaces. But speed wouldn’t mean much without muscle. That’s where our fan-cooled commercial mower Hydro-Gear® ZT-3400® transaxle system comes in. Tenacious to the core, this system allows the unit to handle grueling conditions – conditions in which other mowers would fold. And if you’re passionate about cut quality, nothing beats our iCD™ Cutting System with professional lawn striping kit. The SRS Z2 comes with your choice of 52” and 61” wide mower decks equipped with strong ¼-inch Marbain® steel blades that generate greater lift and improved airflow for not only better discharge, but a better cut. And because our Marbain steel blades are harder, they require less time sharpening. And less time sharpening is more time mowing the lawn. How does this riding mower stack up, you ask? The SRS Z2 mower’s patent-pending operator platform, with its adjustable suspension technology delivers a more comfortable ride by reducing stress on the operator’s body. And when you combine comfort with the SRS Z2’s available horsepower, your body won’t fatigue – taking productivity to new heights! Pair that with integrated forward and reverse levers and ergonomic thigh pads and you’re entering unchartered territory in rider comfort.